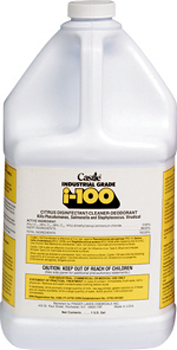 Castle® I-100™ is pleasantly scented and available with lemon or citrus fragrance. It may be used for cleaning and disinfecting hard, non-porous inanimate surfaces(glass, metal, plastic, glazed porcelain, linoleum, tile, leather, vinyl, enamel, and finished wood surfaces) on walls, floors, appliances, and furnishings in work areas. 1. Refer to the instructions on the bottle for your specific use.